Following are the 100% crop image quality comparisons included in most recent Canon EOS DSLR Reviews. Read about the DSLR camera ISO noise tests in the help section to learn more about the tests and how they are conducted. A key take-away from that page is that noise reduction is completely off unless otherwise specified. A low sharpness setting is also used. There are many MB of files required to be downloaded to make all of the mouseovers and mouseclicks on this page function properly - please be patient while they load. I positioned the T5 results between its predecessor, the T3, and the current flagship Rebel model, the T5i (which has the same image quality as the T4i), to make comparing these models easy. The other T*i cameras are then listed in descending model age/number sequence with the EOS 5D III results forming the background and grounding us in terms of the ultimate DSLR image quality available. Note that the details in these comparisons are slightly smaller in the T5 images than in the other 18 megapixel DSLR samples. This is because the T5's Live View display is not quite 100%, causing me to frame the test target slightly wider than the other models. By ISO 1600, the T5's images are looking decent. ISO 800 delivers cleaner results and noise is not noticeable at ISO 400 with a detailed scene such as the fabric example shown below. 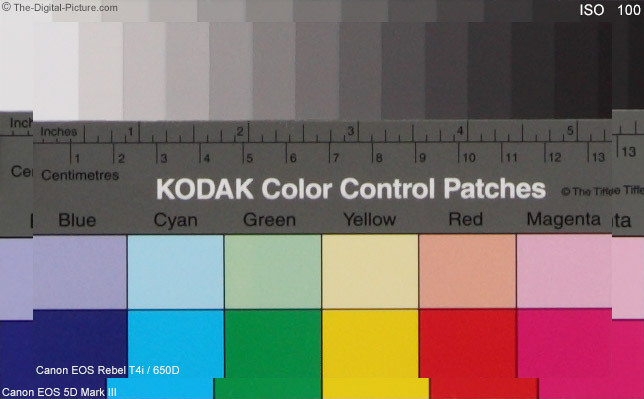 The smooth color blocks in the test target make obvious any noise present, and with this noise illuminatin subject, the drop in noise levels continues to be seen even down to ISO 100. ISO 100 is the ideal ISO setting to use – as long as this setting allows the shutter speed and aperture settings required for a particular image. The other ISO settings exist because ISO 100 often does not allow adequate (or available) shutter speeds and aperture settings. Since you can easily adjust the amount of sharpness given to your photos in-camera or in post, any of these cameras can be tuned to your preference. I slightly prefer the new default setting, but change of "1" in the sharpness setting is the approximate difference. This adjustment leaves only a small noise advantage to the most-recently-released APS-C sensor format cameras. Here is another noise comparison that includes fine details in a piece of fabric. 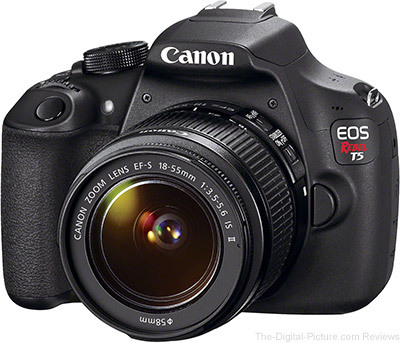 Back to the Canon EOS Rebel T5 / 1200D Review.